Squats are a great exercise to strengthen legs. Bay State Boot Camp group photo! That goes for workouts and eating habits, too. 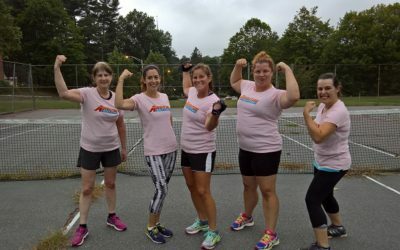 How is Adventure Boot Camp Different? Adventure Boot Camp is committed to helping you reach YOUR goals. Our boot camp is for all fitness levels. No one will be left behind. 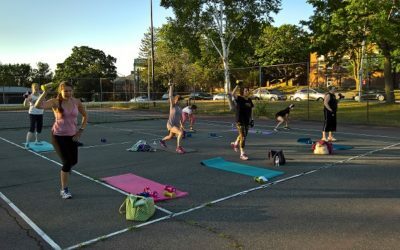 Coach Alexis Rougas-Ermilio leads you through a challenging and fun boot camp workout with advanced exercises for those who have been working out and alternate exercises for those who are just getting started on a fitness program or who are in need of a modification. Adventure Boot Camp is an outdoor fitness program that includes nutritional counseling and motivational training. You will be inspired while participating in a fun and challenging workout led by Certified Adventure Fitness Trainer, Alexis Rougas-Ermilio. Each day, camp starts promptly at 5:30 a.m. Exercises include: Core conditioning, cardio and strength training, circuit training, high intensity interval training, rope training, obstacle courses and more!